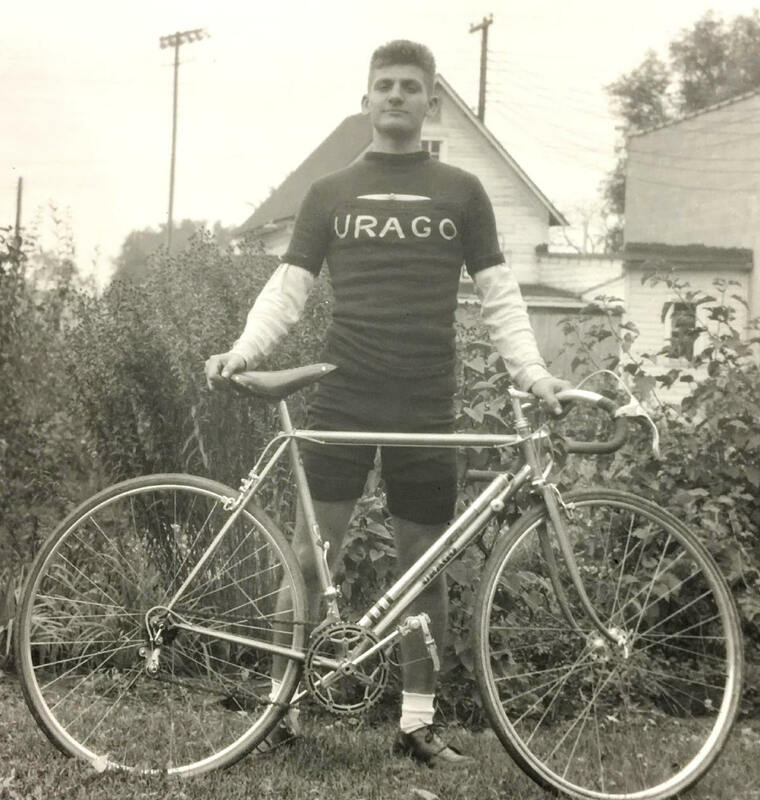 Founded by Dominique Urago in 1935 and operated as a bicycle supplier until sometime in the 1980s. With brothers Joseph and Francois (a track racer, w/championships from early 1920s -1930s and whose likeness is on head badge) Urago were famous for the quality of their handmade frames. Top models were often made by the artisan frame builder Anicet Cattanéo (also based in Nice) who continued building into the late 1970s or early 1980s. The Urago's spearpoint fork crown was a sign of a "Catta" build. "It does appear that the block/shadow lettering inside the radius-ended rectangle first appeared on the down tube in the sixties and continued on some frames until the very early 1970s." "...From 1970 onwards there seems to be ... a wider variation of transfers used. Many of these were printed on Mylar foil and applied to either the down tube or seat tube (or both)." "It also seems that about the same time the "smiling stayer" (Francois Urago) head badge was swapped for a "sticker" version and by the mid '70's these had been replaced by a version of the eagle crest more often seen on the seat tube. The latest frame I have come across retaining a metal head badge being a 1971 frame." "By the late 1970s, Urago seemed to have moved to simple block lettering on both down tube and seat tube." - A. Duprat hollow steel cranks with Simplex chain rings. - Pedals marked "W" inside a star.